28" Cones have 1 internal LED, orange plastic base with black rubber feet, and includes (2) AAA batteries. 18" Cones have 1 internal LED, orange plastic base without black rubber feet, and includes (2) AAA batteries. 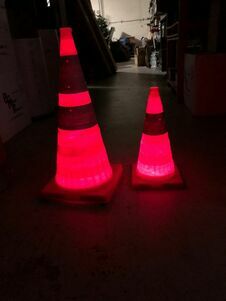 30" Cones have 4 internal LED's, black rubber base, and includes (2) AAA batteries.